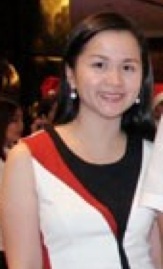 ...must be none other than Cecile Ang, daughter of Ramon S. Ang, CEO of San Miguel Corp. Why you may ask? Well it's because Valentine's Day has been extremely kind to this exceptionally talented young lady, and no, I'm not talking about her love life. This was taken at about 5 pm today at the Royce' outlet in TriNoma. Its chocolates are almost sold out. The sales girl told me this was the first time it's happened to them, and when I asked if there were any more stocks coming in, she said there would be some sent over by the Greenbelt 5 branch. But a media colleague said, he passed by that kiosk, and all its chocolates were sold out also! I espied some boxes in the TriNoma branch's chillers, but the sales girl said these were already reserved and paid for. Of course, Cecile is none other than the franchise owner of this uber-hot Japanese chocolate brand, which has outlets also at the Power Plant in Rockwell and at Robinsons Place in Ermita. Cecile knows I'm a great fan of Royce', and I usually buy the Nama champagne chocolate and its dark chocolate variants. I asked her last November when she was bringing in the brand's equally delicious ice cream. In an email, she said, "We are planning to open a bigger shop that will have Royce' ice cream and chocolate drinks and baked goods. We are just looking for an available space."